New curb extensions are popping up on 35th Avenue in Jackson Heights. Photo: Clarence Eckerson Jr. 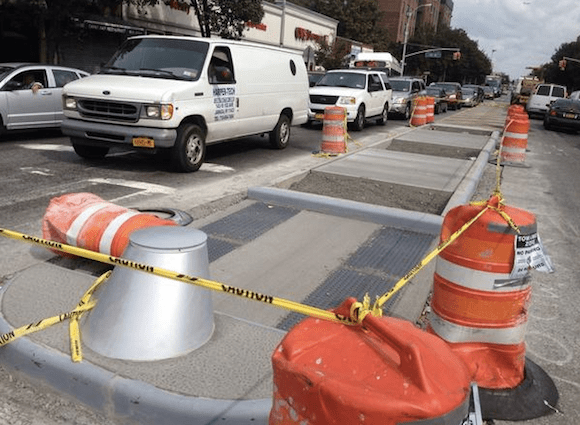 In June, Queens Community Board 3 overwhelmingly supported two traffic safety projects: a neighborhood Slow Zone for part of Jackson Heights and new pedestrian islands on Northern Boulevard. Now those improvements plus multiple Safe Routes to School projects are being installed. Clarence Eckerson Jr. snapped some photos earlier this week as DOT crews poured concrete and installed new signs and speed humps. The Slow Zone covers the area between 34th and Roosevelt Avenues, with the eastern boundary at 87th Street and the western boundary along Broadway and the Brooklyn Queens Expressway [PDF]. It is bringing 20 mph speed limits and 26 new speed humps to the area, which contains six schools, two daycare and pre-K facilities, and one senior center. Slow Zones are popular with CB 3, where they have already been installed in Corona and Jackson Heights/East Elmhurst. On Northern Boulevard, crews are installing nine new pedestrian refuge islands at key intersections along 40 blocks between 63rd and 103rd Streets [PDF]. At its June meeting, CB 3 asked DOT to extend the project east to 114th Street with more pedestrian islands. Pedestrian islands have already been installed at 63rd Street, where 8-year-old Noshat Nahian was killed on his way to school last December. 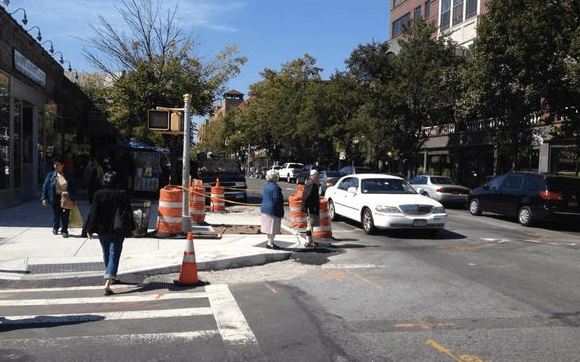 DOT has installed pedestrian islands on Northern Boulevard, including at 89th Street. Photo: Clarence Eckerson Jr. There were slow zones to the north, south and east of our apartment before these new ones. Practically the whole neighborhood is Slow Zone of Jackson Heights is now with these additions! Blows my mind that those islands were not created years ago. This is great news. Moreover, a concern for both pedestrian safety and efficient traffic would dictate addressing the major problem in Jackson Heights with people crossing against the light, often paying attention neither their own safety nor long the lines of traffic (who have the green light), they thoughtlessly delay.